The snow is falling and toy soldiers are marching in North Bay, Ontario, Canada, even though Christmas is still four months away! 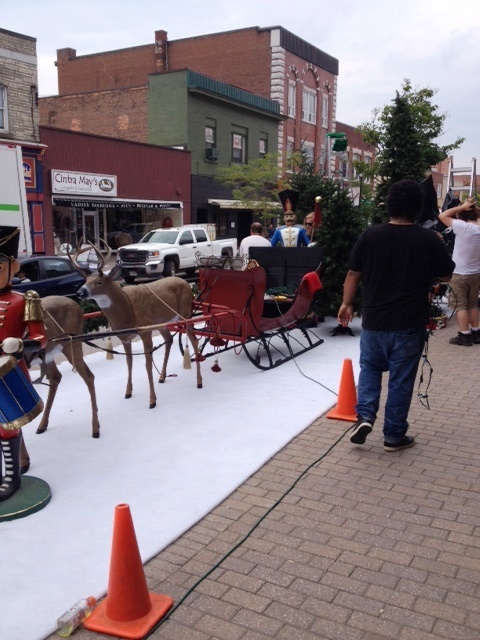 In preparation for an upcoming movie, the downtown area of North Bay is being transformed into a festive Christmas setting. Workers tell BayToday.ca that the holiday movie, named 'On Dasher, On Dancer, On Frankie', is filming its Alaska scenes by bringing decorations, lights, and carpets of imitation snow to the Ontario town. It even sounds like Santa will make an appearance! The locals might enjoy the refreshing scenery – today the temperature was forecast to hit 83°F / 28°C. I have a feeling the weather will be quite different in Ontario this winter when the town heads to the theaters to see their local buildings on the big screen!